Hi guys! Long time no see. Few months ago I posted an Instagram post about a new blush palette that caught my eye when I was shopping at Guardian. The palette is called as "Blush Artist Shading Palette" and it's a part of "Catrice It Pieces Spring & Summer 2016 Collection". While the international launch date was set back in January, I've only gotten to see some of their new products here starting in July. Having to use it for quite a while now, almost 4 months to be exact, I'm here and ready to share with you guys all of my thoughts, so read more after the jump! 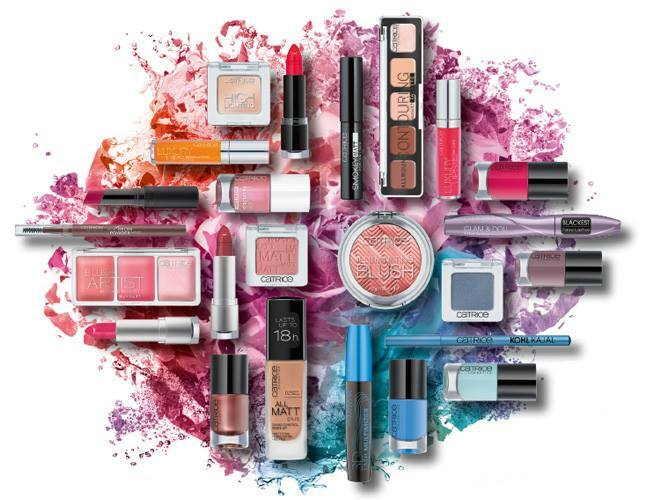 "Catrice It Pieces Spring & Summer 2016 Collection"
Clear plastic packaging- not the cheapo ones, but the plastic material do feel nice, sturdy and expensive. I actually really love the way this palette looks like because I can clearly see the colour of the blushes through the packaging. Downsides of it- although the whole packaging doesn't catch up any fingerprints, it can be scratched easily. They have a very long list of ingredients and obviously I'm going to copy paste them from the official website. MICA, TALC, NYLON-12, DIMETHICONE, MAGNESIUM STEARATE, OCTYLDODECANOL, BIS-DIGLYCERYL POLYACYLADIPATE-2, OCTYLDODECYL STEAROYL STEARATE, CETYL DIMETHICONE, SIMMONDSIA CHINENSIS (JOJOBA) SEED OIL, TOCOPHERYL ACETATE, ALOE BARBADENSIS LEAF EXTRACT, COCOS NUCIFERA (COCONUT) OIL, TRIETHOXYCAPRYLYLSILANE, ALUMINA, SILICA, TIN OXIDE, CAPRYLYL GLYCOL, PHENOXYETHANOL, MAY CONTAIN: CI 73360 (RED 30 LAKE), CI 75470 (CARMINE), CI 77491, CI 77492, CI 77499 (IRON OXIDES), CI 77891 (TITANIUM DIOXIDE). MICA, TALC, NYLON-12, DIMETHICONE, MAGNESIUM STEARATE, OCTYLDODECANOL, SYNTHETIC FLUORPHLOGOPITE, BIS-DIGLYCERYL POLYACYLADIPATE-2, OCTYLDODECYL STEAROYL STEARATE, CETYL DIMETHICONE, SIMMONDSIA CHINENSIS (JOJOBA) SEED OIL, TOCOPHERYL ACETATE, ALOE BARBADENSIS LEAF EXTRACT, COCOS NUCIFERA (COCONUT) OIL, TRIETHOXYCAPRYLYLSILANE, ALUMINA, SILICA, TIN OXIDE, CAPRYLYL GLYCOL, PHENOXYETHANOL, CI 73360 (RED 30 LAKE), CI 77491, CI 77492, CI 77499 (IRON OXIDES), CI 77891 (TITANIUM DIOXIDE). One important thing to note that this blush palette isn't vegan, so perhaps it's not preferable to vegetarian consumers. It contained carmine (CI75470). Carmine or also known as cochineal is a natural red dye obtained from crushed bodies of female cochineal beetles. This dye is widely used in food, cosmetics, and pharmaceutical, therefore no need to worry much about applying it onto your skin unless (of course) if you're sensitive to it, which in this case, is rare. 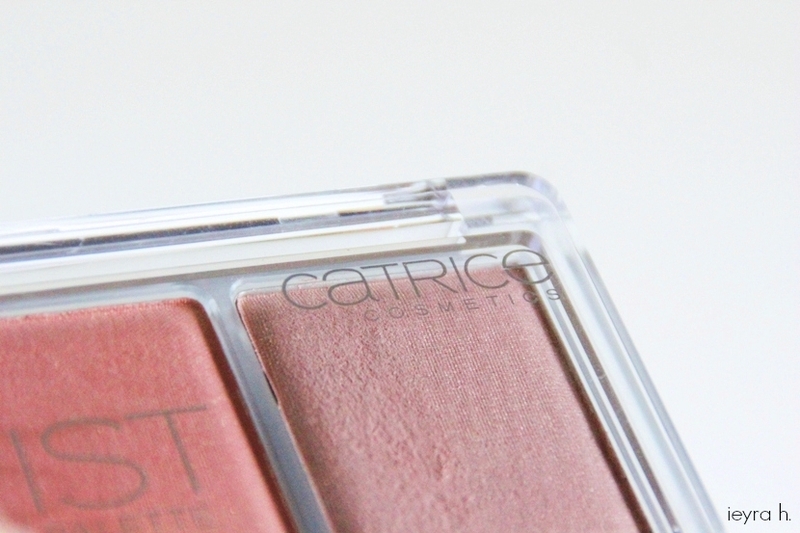 A highlighter would usually contain lower level of pigments compared to blushers but Catrice does not specifically listed their ingredients according to the shade in this palette. Check out the CosDNA analysis by clicking [here]. The names are cute, I love it when brands take the extra time to think up names for their products. I got mine in the first shade, 010 BronzEclat. -The first pan is a matte "bronzing" shade and it's kind of looks like rusty red. It seems to be vivid in the pan but on swatch, it comes out quite sheer and very rosy. 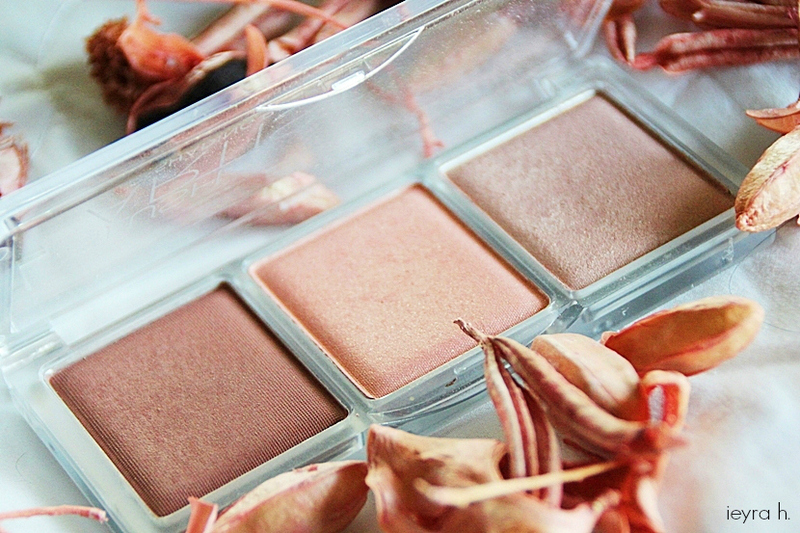 -Second middle pan has a pinched cheeks shade of peach and I quite like it. The blush takes a while to build up the colour and I find myself always layers 2-3 times to get it show up on my cheeks. -The third highlighting shade has a peachy-pink undertone. It looks frosty in the pan and reminds me of theBalm Cindy-lou Manizer. 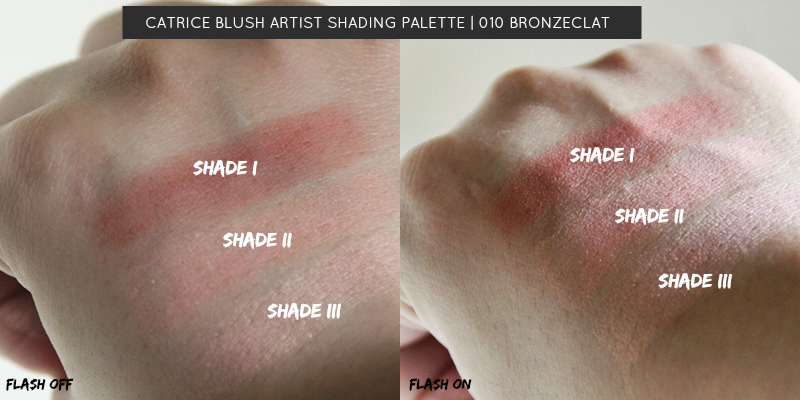 -Shimmers for shade 2 and 3 are not subtle but they are also not that pigmented. Shades- Instantly, the middle pan became my favourite just because I'm pretty much a coral and peach girl when it comes to blusher. I feel like my face would brighten up a bit whenever I use this kind of shade. I've been running it high up onto the apples of my cheeks and then add the first shade to bronze. Does it work for bronzing though? NO, IMO. It's just too rosy... 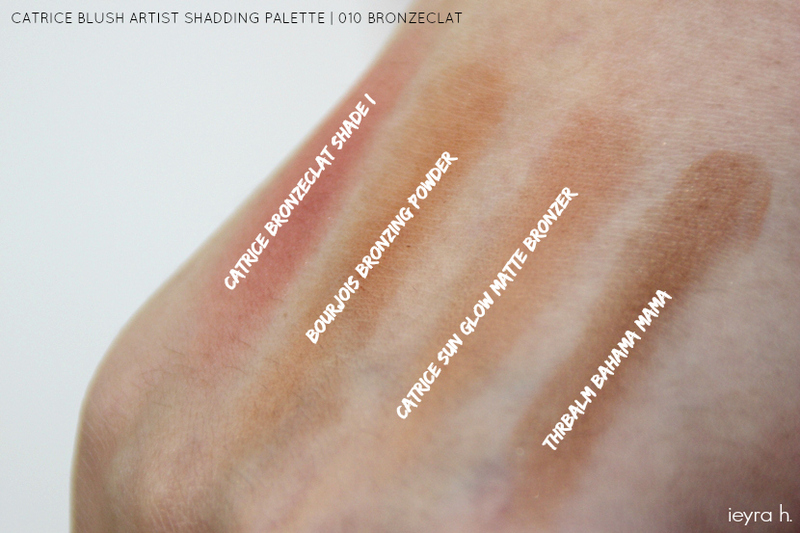 Here I'm going to swatch the first shade along with several other bronzers I have in my collection. Look at how "rosy" Shade I is. Then again, have you heard about the "DRAPING BLUSH TREND"?? It's kind of like sculpting and contouring your jaw lines using only blushers with proper techniques. Well... I'm guessing this palette exists to serve on that purpose, lol. Meanwhile the highlight shade isn't necessarily perfect for me but I like it as an eyeshadow. Texture- They are generally more solid than soft texture but I personally find it varies from shade to shade. The highlighter is chalky and powdery whereas the other two are fine. Application- You really need to pack a lot of pigments onto your brush because they are not so pigmented. For the highlight shade I'd suggest to use small fluffy brush like these two below that I got from an Instagram shop, (they are similar to the one you can buy from Ebay). Larger brush doesn't really pick up the right amount of highlight pigments. Fan brush tak pernah try lah pulak. Blending Ability- I'm not impressed with the first shade as I find it really hard to blend out. It's quite sheer, which is something supposedly easy to work with, but it doesn't. Middle peachy shade and the highlighter are both okay, easily blendable and applying smoothly. Longevity- Decent. On my oily-combo skin, all the 3 shades completely disappeared towards the end of the day. (Disclaimer- I've yet to try and set my face with makeup setting, they could last longer with it). Bottom line- Despite all the downsides, I'm not regretting for having this blush palette as a part of my collection. To think that they are only RM20+, it makes the palette probably one of the best bargains you can have from our drugstore. 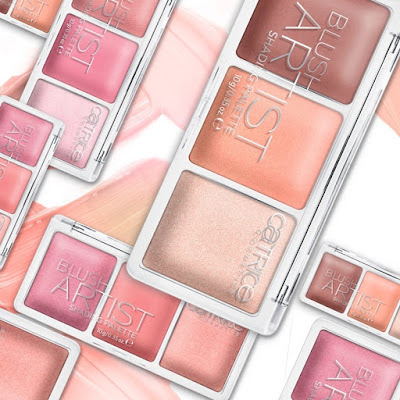 Essence came out with something similar too, but quality wise, I feel like Catrice Blush Artist Shading Palettes are far more better. Would I recommend it? Yes, but don't need the rush. Tak ada pun tak apa. For people or student who are on a tight budget and to those who just started with makeup, I think this is a really good item to have in your kit. Guardian Pharmacy Online [buy here]. I've never tried anything from Catrice before, but these plushes look so nice! lawa warna dia :) nampak natural but bold.